An open floor plan is spacious and modern, and provides plenty of opportunities for social gathering. On the other hand, separating the living and dining space becomes a challenge due to the open, undivided floor plan. Separating the area is achieved through organization, furniture arrangement and color. Separate your living room and dining space with rugs and select furnishings. 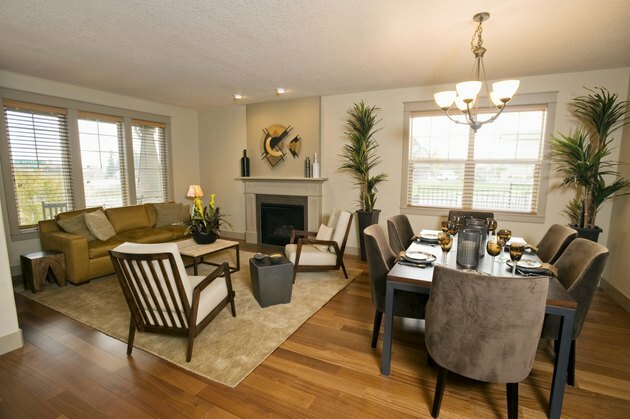 Decide on a piece of furniture to separate the living room and dining area. For example, a sectional sofa with the back facing the dining area will act as a divider. A pair of armchairs may also be used in this manner. Place the dining table in the area behind the sofa or armchairs. Center it in that part of the space. Section it off by using a rug or shelving units to display porcelain dinnerware or other dining accessories. Center the living space around a large ottoman or coffee table. Place an entertainment center or mount a television to the wall opposite the dining area. Create paths for visitors to walk through so that they are not interfering with the function of the space. For example, if the only pathway through the living area is in front of the television, this will quickly become an annoyance. Also, if the path in the dining room is directly in front of the table, this could prove disturbing during family dinners. Arrange the furniture so that there are two paths in each living space. Separate the areas by choosing a color scheme for each. For example, you could paint the dining area a color different from that of the living area. Alternatively, you could accent a focal point, such as a fireplace in the living room. Use accessories in the living room that complement the accent wall for coordination. Add neutral tones to bring the room together. Can I Plant Tomatoes With Beets?